Jialin Luo, 12, is one of 10 finalists in the Grades 7 to 9 category of The First Page student writing challenge. 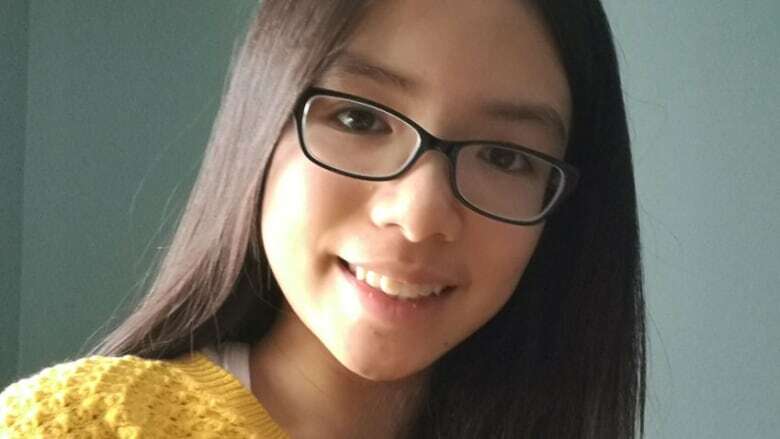 Teleportation Gone Wrong by Jialin Luo is one of 10 stories shortlisted for The First Page student writing competition in the Grades 7 to 9 category. Students across Canada wrote the first page of a novel set 150 years in the future, imagining how a current-day trend or issue has played out. Nearly 2,400 students submitted their stories. Luo, a student at Calvin Park Public School in Kingston, Ont., tackles environmental issues in Teleportation Gone Wrong. "Gather around, ladies and gentlemen!" A loud voice announced. Everyone's heads immediately snapped up, not wanting to miss this moment. A tiny man stood atop of a huge mountain of garbage, towering dozens of metres above the rest of us. "My name is Mr. Martinez, and I proclaim that today, in the year 2168, you will all witness the greatest moment in history!" An astoundingly loud cheer rose up as millions of people around us applauded. My mother and father were clapping and my little sister was hooting with excitement, her wide brown eyes shining. "Ahem. As you all must know by now, this mere device," He thrust his arm up in the air, "can teleport all this," he gestured to the mound of trash, "to places it will never harm anyone or the environment ever again." The crowd surged forward, ecstatic to see the tiny item in his hand. I was shoved ahead very roughly. Irritated, I grumbled, "Time would be better spent on something I'd actually enjoy." "It will be worth the wait." My mother assured me, before giving her attention right back to Mr. Martinez. Mr. Martinez droned on and on, more than occasionally doing an ostentatious action. I felt all my patience drain from my body. My sister's excitement had waned as well. She was now braiding her hair and talking about how her teddy bear would be bored too, although you couldn't exactly count on her to focus on one thing for very long. Just as I was about to doze off, Mr. Martinez coughed loudly to get our attention again. "Ahem. Let us not delay this marvellous moment any further." With a majestic flourish, he indicated for the cameras to start rolling. "In five, four," He counted slowly and squarely. "Three, two," The crowd joined in on the last word, making it almost deafening."ONE!" Mr. Martinez slammed his finger onto the bright red button. The cheers ceased abruptly. It turned so quiet you could hear a pin drop. A hushed whisper spread amongst the crowd, as if each person was too scared to say anything. Confused, I strained to see over the jumble of heads. Immediately, I caught sight of two distinct things. Or rather, two things that were not there. The mountain of litter was gone. But so was Mr. Martinez.